Looking to experience the very best of Scotland? For Scotch whisky aficionados and amateurs alike, Islay is the place to be to explore this intricately made liquid. Scotch has been distilled on Islay for hundreds of years, and distilling is the second-largest employer on the island. 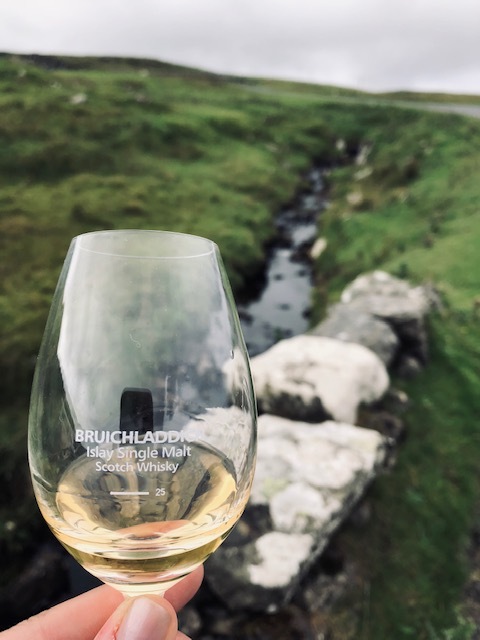 As home to eight distilleries, including Ardbeg, Bowmore, Bruichladdich, Bunnahabhain, Caol Ila, Kilchoman, Lagavulin and Laphroaig, the education you receive in-person at each distillery is the best in the world. The knowledgable tour guides will walk you through all things whiskey- farming, peat, aging, barley and distilling. Broken up by geography- the Southern distilleries (Ardbeg, Laphroaig and Lagavulin) are known as the Kildalton distilleries, and are known for their different style- more smoky and earthy with heavily peated characteristics. The Northern distilleries, which include Bruichladdich and Bunnahadhain, are milder in comparison. Side note: in Scotland, it is spelled whisky- the United States prefers whiskey. 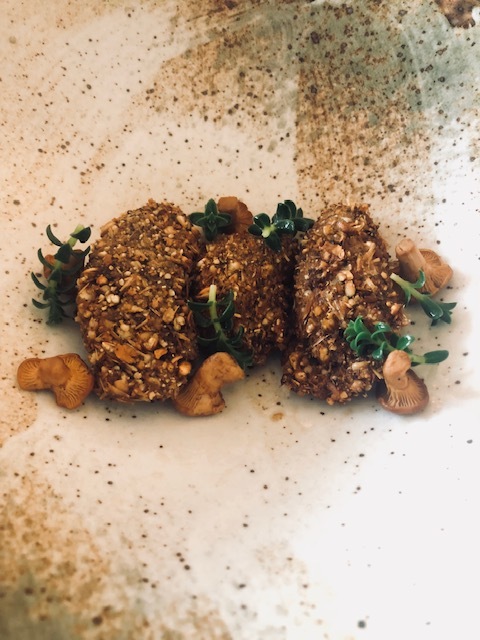 Scottish food can be marked by the better-known Scottish eggs, black pudding (type of blood sausage) and Haggis.On Islay the farm-to-table movement has influenced the traditional Scottish favorites. With fertile soil, clean seas and unpolluted Western winds, the island is primed for agriculture. 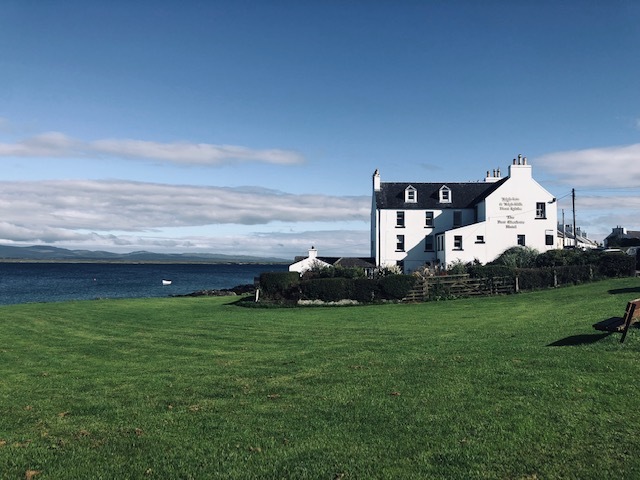 Islay is known for their beef, lamb and game, while the seas bring in delectable fresh catches daily – hand-dived scallops, oysters, langoustine and shellfish. Legendary James Brown of Octomore Farms, sharing a dram of Octomore Whiskey. Take a step back in time when you visit Islay. 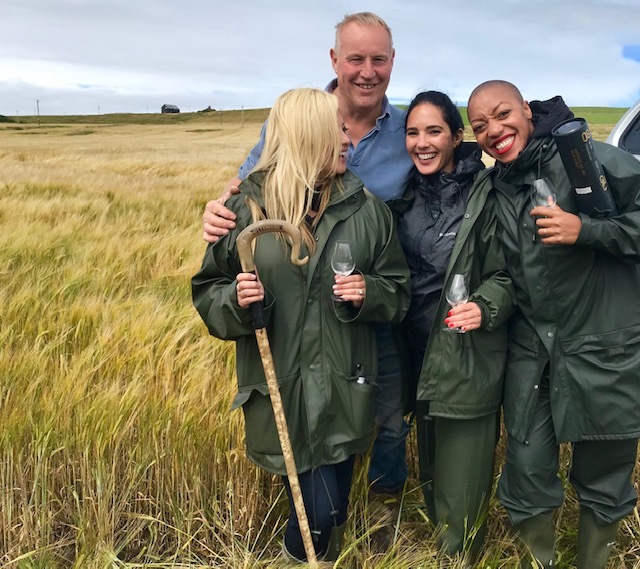 Manners, friendliness and a hospitality is common on the island.On Islay the farm-to-table movement has influenced the traditional Scottish favorites. Some Scottish favorites include haggis, Scotch pie, neeps (turnips) and tattis (potatoes). No matter how beautiful a place may be, it comes down to the people to make it special. 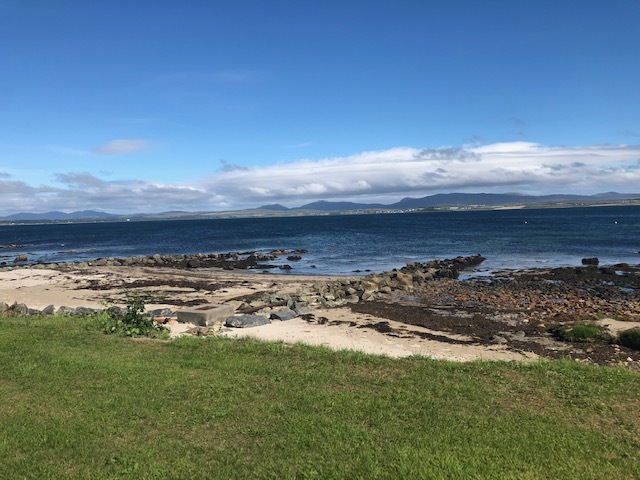 Here on the island it was the interactions with the regulars at The Port Charlotte Hotel, James the Botanist and farmer James Brown where you get to fall in love with the people. While the island only has around 3,000 residents, the capital of Bowmore is home to around 1,000 people. Around 30% of the people still speak Scottish Gaelic, although more by the older generations. The language is still taught in Bowmore, at the Ionad Chaluim Chille Ìle (the Columba Centre). When the whisky festival comes around every May, find natives and visitors alike on the island. 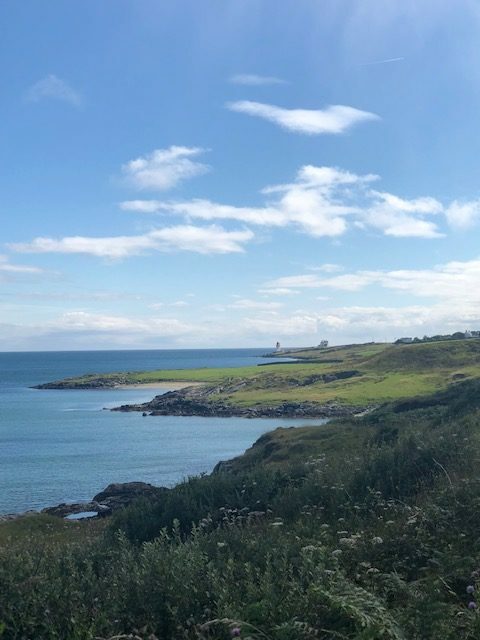 At just 25 miles long and 15 miles wide, Islay is a mountainous coastal playground, with colors of the sea and sky colliding to make a landscape of soft colors. Enjoying the outdoors is one of the many perks to the island, as you feel you are secluded from civilization.For the outdoor enthusiasts, the diversity of so many activities keep people coming back again and again. With miles of trails and beachfront, Islay is perfect for hiking or running. The roads are great for biking especially in the warmer months. Love bird watching? Islay is home to several species of birds, including wintering populations such as the Greenland white-fronted and barnacle goose. The barnacle geese number around 35,000. Between 100-200 species can be found on the island at any given time of the year. The gorgeous seas surrounding the island are alive with life, and several boat tours are available to bring you closer to nature. You can often spot otter, seal, dolphins and a few species of whales including the minke whale, killer whale and pilot whale. Seal watching is popular during June, where groups of a thousand are a common sighting. For adventurists, the third largest whirlpool in the world, with tidal currents as fast as 10 knots is one of the most dangerous stretches of water around the British Isles. One should experience it from a safe distance! The coastal seascapes are something out of a fairytale book, and the colors that meld together on the island are the work of a skilled painter. The highest peak of the island at 1,612 feet is called Beinn Bheigier, and the east coast of the island towers over the crystal clear waters of the Sound of Islay. The 11 lighthouses on the island not only help aid with navigation- they date back to the 1800’s. The Rinns of Islay on Orsay by Robert Stevenson dates back to 1825, while Ruvall was built in 1859, and not only make for great views, but a piece of accessible history. 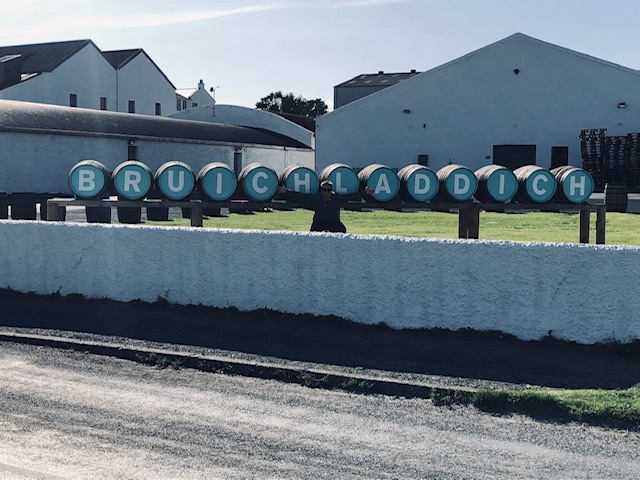 These are just five reasons to add Islay to your bucket list. Can you list anymore?